Exuviance has come up with a revolutionary application for Vitamin C, one of it's kind on being mixed with your favorite serums and moisturizers. Seen in the magazine's "New You" and "Dermascope", Exuviance Vitamin C Anti Aging Booster is in a powder form for added stability to the active vitamin C. Vitamin C reduces free radical damage while adding firmness to the skin, smoothing find lines and wrinkles and reducing age spots. Exuviance uses their patented mega anti oxidant Aceta-C™ to enhance the potency of Vitamin C. Without fillers or water, this product is 100% pure active, having no ingredients that are not beneficial. This allows for long term use, having over 200 applications in each bottle. For application, apply the anhydrous powder from the shaker top on the container to your favorite serum or moisturizer to boost the benefits. 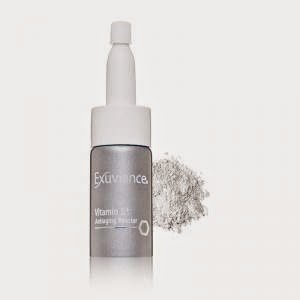 Exuviance recommends mixing with Exuviance Evening Restorative Complex for an optimal dual pair of benefits. shopspaViolet offers a smokin' deal to pair this duo with an added benefit of Exuviance Intensive eye Treatment pads for a trio product savings of $33!. You put truly exceptionally supportive data.